A couple of years ago when I was passing through Cincinnati, I made a visit to the nearby Creation Science Museum. It was an utterly fascinating experience. 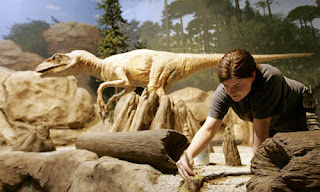 In this slick, state-of-the-art facility, one learns how God created the world six thousand years ago, making all the kinds of animals (including dinosaurs) on the sixth day. Then, one follows the exhibits chronologically through the first few chapters of Genesis. Videos, shiny displays and animatronic characters greet one along the way―including my favourite, a very life-like Methuselah, who asked each visitor, “Can you guess how old I am?”, and laughed jovially when his age was underestimated. Noah’s ark is given particular attention, from the details of its construction to how all the animals were fed en route. There is even speculation on how the door was sealed before the rain started, with a tentative conclusion that God probably did so by a direct miracle. It is places like Creation Science Museum that we normally think of when we hear the phrase “taking the Bible literally”. However, many today would probably be surprised to learn that these contemporary, fundamentalist interpretations of Sacred Scripture are actually not literal readings of the Bible. The literal sense of scripture is something quite different, and has an ancient, venerable tradition in Christian theology. The Church Fathers distinguished four senses contained throughout Sacred Scripture: the literal, allegorical, moral and analogical. The latter three of these are the spiritual senses, and flow from the literal, or “historical”, meaning. So what is the “literal” interpretation of Scripture? The Catechism defines it thus: “The literal sense is the meaning conveyed by the words of Scripture and discovered by exegesis, following the rules of sound interpretation.” In other words, the literal sense is not necessarily what one might arrive at the first glance of the text. One has to figure out what basic meaning the text really intends. The interpreter of Sacred Scripture, in order to see clearly what God wanted to communicate to us, should carefully investigate what meaning the sacred writers really intended, and what God wanted to manifest by means of their words. Sometimes this is easy―like in St. Thomas’s example. Everyone should be able to figure out that God’s “arm” literally signifies his active power. Other times it is hard, as in some of the more enigmatic parables of Jesus or in obscure ancient rites described the Pentateuch. What the curators of the Creation Science Museum have unfortunately overlooked is that rather than deriving their science from a misinterpretation of the literal meaning of Genesis, they should have used science as an aid for rejecting false literal readings. Authentic science has discovered that the world is about four billion years old, that man evolved from lower creatures and that there was no world-wide flood four-thousand years ago. This is a pretty good sign, to say the least, that the literal meaning of some passages in Genesis is not historical in the modern sense. To get at the literal meaning, we need to turn to Biblical scholarship and figure out what the authors really intended to mean with these stories. It not infrequently happens that something about the earth, about the sky, about other elements of this world, about the motion and rotation or even the magnitude and distances of the stars, about definite eclipses of the sun and moon, about the passage of years and seasons, about the nature of animals, of fruits, of stones, and of other such things, may be known with the greatest certainty by reasoning or by experience, even by one who is not a Christian. It is too disgraceful and ruinous, though, and greatly to be avoided, that [a non-Christian] should hear a Christian speaking so idiotically on these matters, and as if in accord with Christian writings, that he might say that he could scarcely keep from laughing when he saw how totally in error they are. In other words, bad literal interpretation does not only mislead Christians, it scandalizes non-Christians. It can seriously damage the proclamation of the Gospel and is thus to be avoided assiduously. Sacred Scripture is a great treasure. Only when we approach it with open minds, intelligence, humble reverence and knowledge of the Church’s tradition can we really mine the great riches therein and come to know and love its primary Author, who is God himself. And that, after all, is the whole point.